Other than the attractions of the two main cities, Auckland and Wellington, there is plenty to and see on New Zealand's North Island. As the heartland of the Maori people, the North Island is rich in history and culture, with sites such as Rotorua and Wai-O-Tapu especially significant in local history. A mixture of unique culture and strange natural phenomenon make these places extremely interesting. 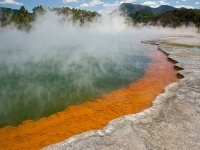 Rotorua, for example, has the most thermal activity in New Zealand, with hot springs and thermal baths. It draws crowds from all over the world to enjoy this natural spa treatment. Similarly, Wai-O-Tapu is a natural spectacle of thermal activity which boasts spectacular colour schemes in its pools of warm water, which have been active for over 100,000 years. In the very northern tip of the island, known as Northland, towards the warm waters of Polynesia, lies the ancestral home of New Zealand's first inhabitants. Here visitors can enjoy the beautiful beaches along the coast and join in the locals love for watersports of all kinds including surfing, diving and skiing. And if you want to learn more about the native people of the North Island, why not visit Mitai Maori village which offers a genuine introduction to an indigenous cultural experience in a sacred and spiritual place. A popular way to see a large part of the island is to embark on a driving tour around the North Island. One common suggestion is to start your self-driving New Zealand tour in Auckland and make your way around in a loop to many key areas like Rotorua, Napier, Wellington, Taupo, Whakatane, Waiheke, Kaitaia and Gisborne, so one can experience a good variety of what is to offer on the island.